How the heck are ya?? It's been a while- thanks for being so patient while I took a much needed breather! I told ya I'd be back- and back with a vengeance!!!!!! BWAHAHAHAHAHA! I've been a blogging maniac today- editing about two trillion pictures and putting them up on blogs that I have scheduled to come your way! How the heck was your Thanksgiving?!? I hope amazinglyyummy! <--New word. Ours was pretty good. We had to split the time between both sides of the family, which can be a little stressful...but it was definitely a delicious one! Oh man...I'm reminiscing right now...man was it so yummy! We had an apple cider brined free range turkey, yams with about 2 pounds of delicious toasty marshmallows on it, green bean casserole (of course), homemade cranberry sauce, mashed potatoes, organic spinach salad with homemade champagne vinaigrette from homemade champagne vinegar!, sausage AND bacon stuffing, and PIES PIES PIES! So for the next few blog posts, I'm going to share with you guys a few recipes for some of my favorite pies. YAY! I've edited each recipe a bit to make them A LOT easier for you all at home...because you know...I'm a great friend like that. I know the reality is many people don't enjoy spending 3 hours in the kitchen making one pie like I do...many of us want it done ASAP so we can get the heck out of the kitchen and start eating! So, first up is my Mixed Berry Pie! When I make mine at home, I kind of search through the store and/or farmer's market to find what berries are the freshest and ripest. This of course would be during the little berries' peak season...which is NOT right now. Please please feel free to find a good organic frozen array if that's easier for you. 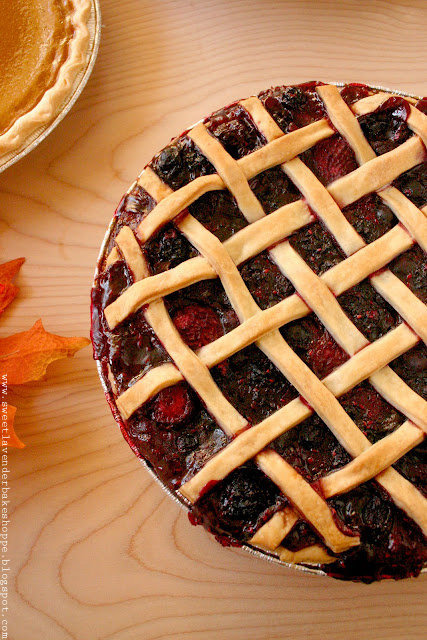 If you're making this pie in the next few months you might have to anyway. I won't tell anyone. 3. In a large bowl, combine both bags of defrosted fruit, juices from bags, vanilla sugar, cornstarch, red wine, and lemon juice; toss until combined. Pour into prepared bottom crust. You might have some left over. 4. On a floured surface, roll excess dough back into a ball and then roll into a circle with a rolling pin. Cut into as many 1/2" wide strips as you can; discard the shortest two. Weave strips over filling to form a lattice. 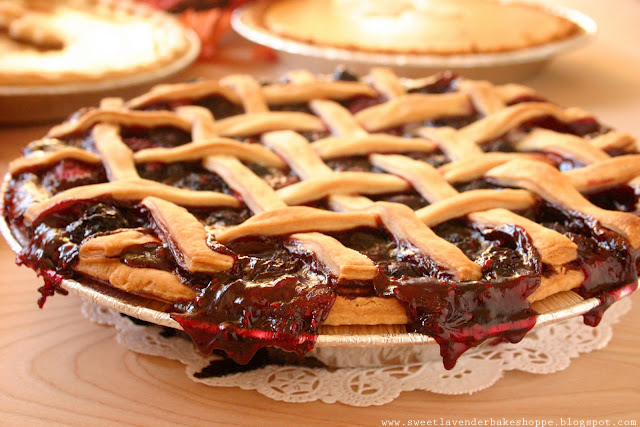 Using a small knife, trim strips so they are equal in length with your bottom pie crust. Using regular water, dip your finger in it and place a drip of the water under each strip of dough- press lightly to seal. 5. Using a pastry brush, lightly brush lattice with egg wash, milk, or cream, and sprinkle with turbinado sugar. 6. Place pie on a baking sheet lined with tin foil. CRUCIAL! Please line with tin foil unless you want to scrape sugary messes off your pan. This will bubble and drip over. 7. Bake until filling is bubbling all over, about one hour...maybe more (tent with aluminum foil if crust starts to brown). Transfer pie to a wire rack, and let cool to room temperature.